Thermal Sensor can detect the temperature of a subject without any physical contact. 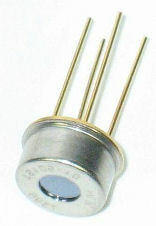 The technical name for the sensor is known as Thermopile Sensor. The sensor is able to detect the temperate of the surface of an area from a distance through the air. This is possible because the sensor is able to pick up the radiated heat in the form of IR (infra-red) from the subject. Thermal Imaging Sensor is getting more and more popular compared to the vision camera. While the typical vision camera (CCD) picks up colour from the scene, a thermal camera picks up heat image. This helps the system to easily differential objects base on heat rather than colour. The thermal sensor is often used to detect dangerous hot surrounding and also to detect the presence of people. A technical name for Thermal Sensor is known as Thermal Array Sensor. Thermal Array Sensor is low in resolution compare to the vision colour camera. A high-resolution version (Thermal Imaging Camera) is still quite costly. Thermal array sensor (low resolution) is a more cost-effective sensor and is enough to serve its purpose. PIC-CONTROL customised the electronic solution for your businesses. For thermal sensing application and inquiry, you can contact our sales engineer or visit our website to learn about our other electronic engineering services.